One of the best ways to make your training videos much more effective is to add voice overs. Lots of novice video creators are reluctant to record their own voice, which usually results in videos that have WAY too much text on-screen. Or, maybe they want to keep all that on-screen text because they think they’re doing a favor to people that are hard of hearing. You’ll get used to the sound of your own voice, I promise! Plus, you can add Closed Captions and dump all that on-screen text. Closed captions are pretty easy if you’re using Camtasia or YouTube for your videos. That is to say – there is a balance! Of course, some learners need on-screen text, whether because they can’t use the volume, or they speak English as a second language, or yeah, maybe they’re hard of hearing. So, always include Closed Captions (they benefit EVERYONE!). But dump most of your on-screen text. So let’s talk about doing a good voice over. I have learned the hard way how to do a good voice over. That is – I’ve done a lot of bad ones. Here’s a poor quality voice over from a video I did last year. I’ve done some OK ones recently. But I can do better. My goal for the next year is to become consistent in quality of my voice overs! To do a good voice over, start with a microphone and a copy of Audacity (free and open source!). At a minimum, use a headset microphone. Your laptop’s microphone is more likely to pick up noise around you, as well as its own vibrations. I use a Blue Yeti microphone. Honestly it’s more microphone than I need, mostly because I can’t afford a microphone stand and don’t have a good studio setup! The Yeti picks up everything, including my hallmates chatting through a closed door. I’ve also used a simple USB headset which worked OK.
And really, use Audacity for your sound recording, even if it adds another step to your video production. I develop a lot of videos in Camtasia and I used to record my voice overs directly from within Camtasia. You lose a lot of control over your sound quality by recording in Camtasia and my voice overs just never turned out as well as when I use Audacity. Here’s a photo of my set-up. 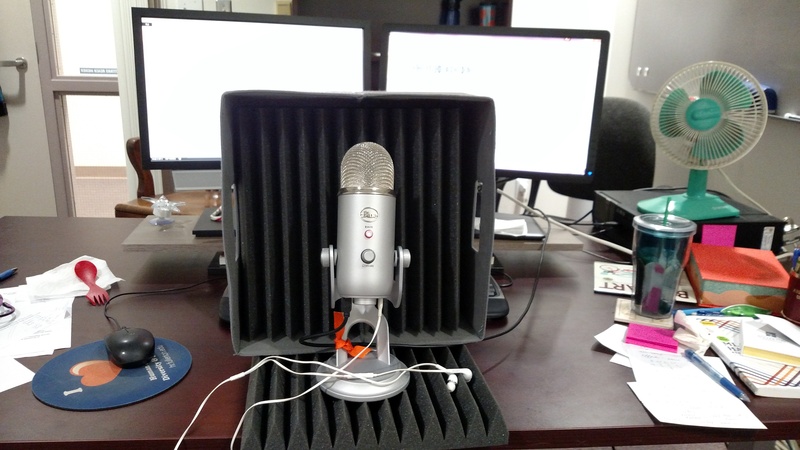 I picked up some cheap acoustic tiles from Amazon to help with dampening echos from my boxy office. Setting the mic on a tile helps reduce the background noise transmitted through my desk by my desktop computer. The number one tip I can probably give you is to use headphones with your mic, or set up your headset to feed the sound of your own voice to your ears – hearing the sound of your recorded voice as you are recording will dramatically reduce the chances of recording distorted audio. It keeps me from talking too loud! See how the audio waves are touching the sides? You don’t want that. Sounds like I’m talking into a tin can! To use this feature right, do two things. First, when you record your voice over, include at least two seconds of room noise, just the general noise that happens when you’re not speaking. Second, use those two seconds to set the Noise Profile when you use Audacity’s Noise Reduction feature. The Noise Profile teaches Audacity what noise you DON’T want so that it knows what to eliminate. Here’s a short and sweet video that explains all this. In any case. Lynda.com and YouTube to the rescue! Here’s a Lynda.com video that shows how to calibrate your mic in Audacity. Here’s an awesome video that gives the basics of recording quality voice over using Audacity. It’s the same track, but I think it sounds much better! Here’s how they compare visually in Audacity. Notice that the sound waves extend pretty much as far as they can without “touching the sides” and becoming distorted. EDIT: I realized after I listened to it again at home that there’s actually a good bit of background noise. I have a lot to learn – you have to remove the background noise BEFORE you do anything else. So let’s try that. You can see that the parts where there are no vocals are much flatter.